COMMENTS ON INDIAN COMPANY LAW: WHETHER THE PROVISIONS OF THE COMPANIES ACT 2013 ALLOW THE PRIVATE LIMITED COMPANIES TO HOLD BOARD MEETINGS AT A SHORTER INTERVAL TO TRANSACT SOME URGENT BUSINESS? WHETHER THE PROVISIONS OF THE COMPANIES ACT 2013 ALLOW THE PRIVATE LIMITED COMPANIES TO HOLD BOARD MEETINGS AT A SHORTER INTERVAL TO TRANSACT SOME URGENT BUSINESS? The answer is NO as it does not openly prescribe the manner in which the private limited companies can convene a board meeting at a shorter notice. What Secretarial Standard of ICSI says ? As per Secretarial Standard 1, Clause 1.3.1 which states that the notice convening a Meeting shall be given at least seven days before the date of the Meeting, unless the Articles prescribe a longer period. As per Secretarial Standard 1, Clause 1.3.1 which states that to transact urgent business, the Notice, Agenda and Notes on Agenda may be given at shorter period of time than stated above, if at least one Independent Director, if any, shall be present at such Meeting. If no Independent Director is present, decisions taken at such a Meeting shall be circulated to all the Directors and shall be final only on ratification thereof by at least one Independent Director, if any. In case the company does not have an Independent Director, the decisions shall be final only on ratification thereof by a majority of the Directors of the company, unless such decisions were approved at the Meeting itself by a majority of Directors of the company. The fact that the Meeting is being held at a shorter Notice shall be stated in the Notice. 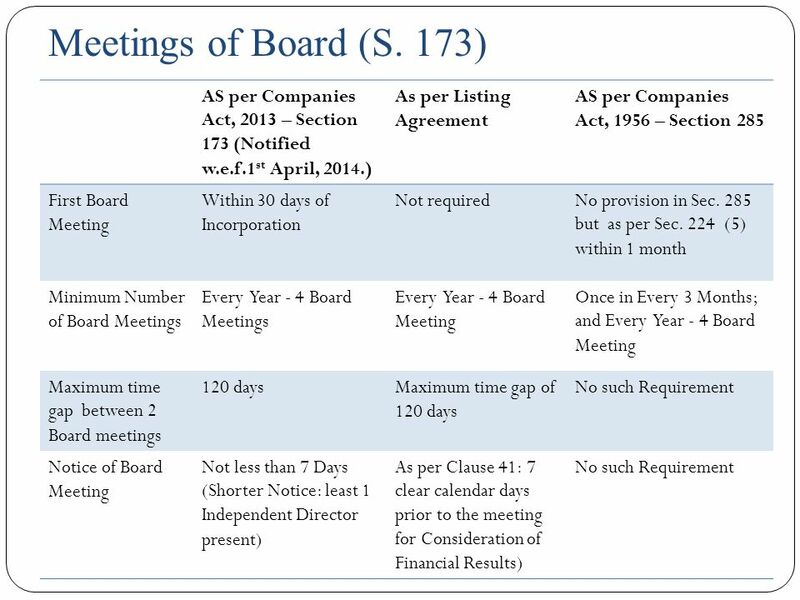 The Companies ( Meetings of Board and its Powers) Rules 2014 issued as per the G.S.R 240 ( E ) dated 31st March 2014 issued by the GOI is silent about the seven days’ notice for the board meeting and whether a board meeting can be convened at a shorter notice by the companies or not. Provided that a general meeting may be called after giving a shorter notice if consent is given in writing or by electronic mode by not less than ninety-five per cent of the members entitled to vote at such meeting. In other words , CA 2013 is very clear about the convening of a general meeting at a shorter notice whereas it is ambiguous in convening the board meeting at a shorter notice as regards to private limited companies. No independent director is to be appointed for a private limited company under the CA 2013. As such, the wordings in the section 173 (3) of the Companies Act 2013 as regards to the presence of one independent director in the board meeting that is convened at a shorter notice is ambiguous and creating administrative inconvenience to the private limited companies. For instance, if a private limited company with just two directors can have the board meeting at a restaurant where they meet accidently and willing to treat it as a board meeting held at a shorter notice with their mutual consent and to record the proceedings of their discussion through the minutes. However , wording of section 173 (3) does not allow this as it creates an impression that private limited companies cannot call their board meetings at a shorter notice as there are no independent directors in the private limited company. One may argue that the SS-1 is clear and it allows that a shorter meeting of a board of directors of a company can be held with the consent of the majority of the directors of the company. However, it is to be noted that In Rupak Gupta v. U.P. Hotels Ltd, it was held by NATIONAL COMPANY LAW TRIBUNAL NEW DELHI BENCH( NCLT) that for conducting e-board meeting under rule 3 (3)(e) is directory, not mandatory. 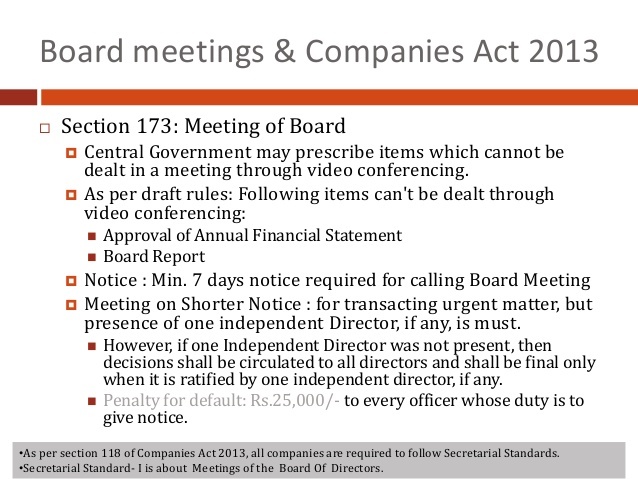 Directors can attend board meeting via video-conferencing without intimating at beginning of calendar year as prior intimation required for conducting e-board meeting under rule 3 (3)(e) is directory, not mandatory. Hence, in view of the above, it is submitted that section 173 (3) of the Companies Act 2013 has to be amended that in case of private limited companies, with the consent of all the directors or the majority of the directors, a private limited company can convene a board meeting at a shorter notice or with the less than seven days’ notice as explained and illustrated in the SS-1. This will help the private limited companies to transact the urgent business at a shorter interval without any legal impediments. Will the MCA issue a clarification circular or removal of doubt allowing the private limited companies to convene a board meeting a shorter notice to transact some urgent businesses with the consent of all or the majority of directors under section 173 of CA 2013?